I stopped there for breakfast w/friends this weekend and the food was good, fast and super cheap. You could bring a family here to eat and not break the bank! Clean bathroom. Great omelet! Skip's Diner is a cute and clean little diner with a lot of charm! The food is very tasty, fresh burgers--not frozen, great breakfasts, try the roast beef hash that is made to order w/REAL roast beef(comes with 2 eggs and toast) for under $4.50. All soups and chili are made from scratch. This is a hidden little gem, give it a try! It's a dive. But if you can get past the sanitation issue you'll love eating here. Classic greasy spoon. Same people sitting at the same seats day after day. If Ray Nitschke has a stool named after him you know it's worth a stop. Skip’s Diner is located in Ashwaubenon on the West side of Green Bay. Skip’s is larger than it perceives to be from the outside of the building. 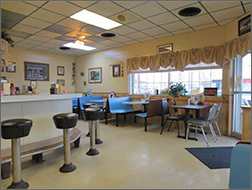 The diner is very clean with a bright homey casual atmosphere. The décor is country. Adorning the large windows are tan and white small checkered café curtains. There is a nice sized counter with booths and a few tables for dining. Skip’s Diner is a place that has regular customers who like nothing better than to meet and have a good conversation and home cooked meals. My waitress came over in a friendly manner to take my order. Today, they were featuring their homemade soup, Booyah. I am partial to that soup, so I ordered a bowl for $2.65 and also Skip’s Diner Favorite, which is a hot beef sandwich with mashed potatoes smothered in gravy for $6.25. My bowl of Booyah was brought out right away with three packs of saltine crackers. My soup was served nice and warm. 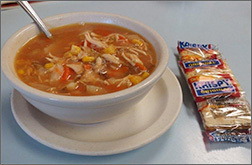 The Booyah was densely filled with tender shredded pieces of chicken, diced celery, onions, very thinly sliced small russet potatoes with the skin still on, kernel corn, and carrot slices. The soup was very savory, it was not too salty and the kernels of corn gave it just hint of sweetness that tasted delicious. My roast beef sandwich came just when I had finished my soup. My plate was filled with a large mound of homemade mashed potatoes that were smooth in texture and had a good flavor. The beef was sliced thick with just bit of pink, very tender and seasoned nicely. 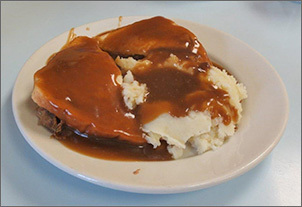 My sandwich was filled thickly in between two thin slices of white bread, and covered with smooth beef gravy which tasted very good over everything. Skip’s Diner is open 7 days a week and only serves breakfasts and lunches. Heads up, they only accept cash, debit and credit cards are not accepted.